28. Will You Pay More? 29. Where Will You Buy Pet Food? 30. What Motivates Online Buyers? Have you ever looked at that sack of dog food you put in your shopping cart, and said to yourself, “Wow, I spend more on food for Doodles than I do on food for myself”? You just might be right. Quality pet food is an expensive commodity, with the most expensive dog foods going for nearly $40 per 2.2 pound bag! Why is that? Well, I think it’s a societal change thing. The cost is high because we’re increasingly willing to pay money on the pets we have, as opposed to the kids that we don’t have. We’re just not breeding anymore the way we used to – in 1982, 61% of households had at least one child. Today, it’s just 41%. And in 1982, 56% of households had at least one pet. Today it’s an amazing 70% of households with at least one pet! It’s Because People Want to Be Like Me! The thing is, more and more, people actually are like me – they’re not changing their minds about remaining child-free. They don’t feel that they’re missing anything by not having children. And they know that often the difference, later in life, between having children and remaining child-free is nothing more nor less that taking a taxi to the old folks’ home as opposed to being driven there by offspring. People are waiting to have kids, and in some instances, not having them at all. In 1970, the average age at which a woman had her first child was 21.4. In 2016, it was 26.6. Today, women are more likely to delay having children until they reach their early 30s, if they ever have children. Okay, so I’ve just decided I like “Doodles” as a dog name. Beats the hell out of “Fido,” from where I’m sitting, since nobody, anywhere, calls any dog “Fido” anymore, and I hate those “cutesy” articles that use the name. Henceforth, I’m saying “Doodles”! Here’s the thing – Kayla, or Breanna, or Kyle or Taylor or whatever the current trend is in kid names just doesn’t apply any longer. As I’ve just suggested, people aren’t having kids the way they used to – instead, they’re adopting dogs. And spending accordingly. The money that might once have been spent on kids’ clothing and accessories is now being directed toward dogs and other pets. We’re not spending an estimated $23,000 over the life of a child. Instead, we’re spending approximately $42,000 over the life of a dog. Still a pretty significant chunk of change, but not what we’d spend on a kid. Now, that’s just you. What does this mean nation-wide? Let’s take a look at our first graph. You can see that in 1994, people spent about $15 billion on pet food and accessories, and you can see how the figure climbed since then, rising to an estimated $72 billion in 2018. That, in and of itself, tells you everything you need to know about the rise in pet popularity and the money that people are willing to spend on their four-legged friends. You can see the steady climb. Our second graph shows us that in 2016, pet owners spent 24.6 billion dollars on pet food and supplies, and the forecast shows that by 2022, we’ll be spending more than 30 billion. The third graph shows pet market sales between 2011 and 2018, and shows a steady increase. We are spending money like never before on pet food and supplies, and you can thank a specific demographic for that. You can thank people between the ages of 45 and 54 (Generation X) for the increase in pet ownership, and therefore also for the increase in sales of pet foods and supplies. When you look at our fourth graph, you can see that Gen X contributes by far the most in terms of dollars to the pet industry nation-wide, and that they’re closely followed by Baby Boomers – those people age 55-64. You’ll also notice that pet ownership seems to increase as people age, with a slight increase in the 25-44 age group followed by the spike with Gen X and Boomers. Then, once you look at the 75+ demographic, you find that pet ownership drops significantly. Of course this makes sense, since young people are usually working on building financial security, whereas Boomers and Gen-Xers have already achieved it. If you look at this graph from BankRate.com, and compare it with our market segmentation graph, you’ll see the correlation very clearly between income and pet ownership. You’ll also notice, comparing the two graphs, that both income and the pet store market base tend to decrease with age. This correlation may not be entirely income-based, though. Certainly seniors on social security are probably less likely to be able to afford pets, but there are other issues as well. Seniors often face limited mobility and are less likely to have pets. Additionally, many assisted living complexes and nursing homes do not allow pets. From this graph, we can see that the money Americans spend on pets is forecast to increase. Of course you could argue that the cost of everything is going up, but what this also tells us is that pets are very much a part of the typical American household, and that’s not likely to change any time soon. So where, specifically, are Americans spending their money on pets? Let’s consider some specific companies. In the material that follows, we’ll take a look at exactly where Americans are spending their pet dollars – which companies command the biggest share of the pie. Our first graph shows us that there are two leading pet stores across the United States – PetSmart, followed by Petco. Together, these two giants own 47.92% of the market. Other pet stores comprise 52.8% of the market. Of course, you have to consider that when we say “other,” that means every single other pet store in the country, from the “coulda been a contender” chains to the mom-and-pop operations that have just a single store. So, if you’re thinking that there’s a bit of a monopoly going on when it comes to pet food and supplies, you’re right. Our next graph will show the monopoly in a startling way. So there’s PetSmart, rocketing off the page with nearly 1,600 stores nationwide, Petco coming up fast with nearly 1,500 stores, and Pet Valu a respectable third place with over 950 stores. The other chains don’t even come close. But what does this mean in terms of revenue? The worst year for PetSmart was 2017/2018, with revenue of approximately 5,340,000 million USD. Their best year was 2015/2016 with revenue of around 5,867,400 million USD. The worst year so far for Petco has been 2011/2012, with revenue of 3,070,800 million USD. The best year was 2015/2016, with revenue of 3,999,200 USD. So, even in their best year, Petco didn’t even come close to PetSmart’s worst year. This tells you a lot about which chain dominates the US market when it comes to pet food and supplies. When we’re considering pet expenditure in the United States, it’s definitely worth taking a look at Blue Buffalo. See how this graph climbs from 2013 to 2017? Blue Buffalo is a company that makes a variety of natural food products for dogs and cats. Clearly, people are willing to pay a lot of money for pet food, given that Blue Buffalo is one of the most expensive brands on the market. You’ll find Blue Buffalo mainly in pet superstores and specialty stores, where they seem to command a significant share of the market. That brings us to our next consideration – exactly where are people buying their pet food? 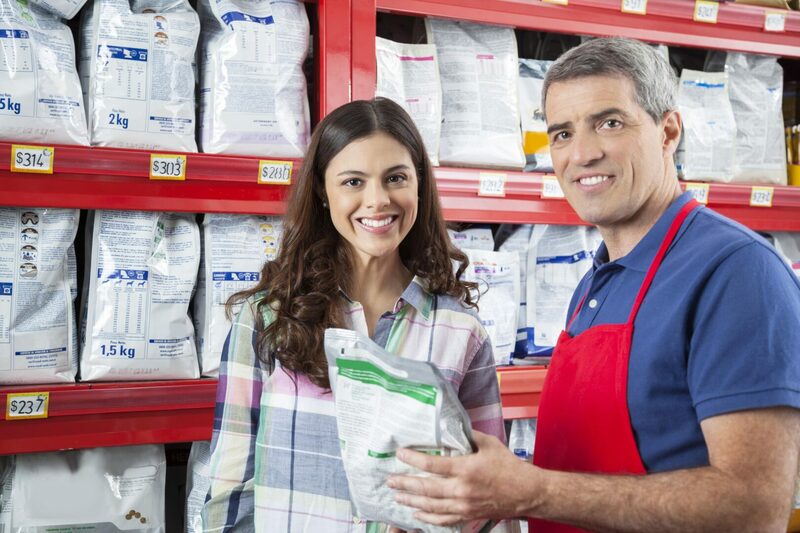 We all have preferences as to what types of pet food we buy, and where we buy. Personally, I’ve raised many dogs (and a few cats) to ripe old age feeding nothing more than generic pet food. However, pet food is big business, and I realize that I’m in the minority. There are more than a few people who are willing to pay top dollar for pet food, and whose pets likely eat better than most humans. So what are we buying, and where are we buying it? Let’s take a look. From this graph, we can see that most people buy their pet food from mass market locations – in other words, places like WalMart. Pet specialty stores come in a close second, followed (again closely) by grocery stores. People are also buying online, from independent pet stores and from farm and feed stores in equal measure but not to the extent that they buy from other channels. It would appear that hardly anyone is buying their pet food from dollar stores, which is probably a good thing given the horror stories about pet food that comes from other countries and ends up poisoning animals. Honestly, I’m not sure what this graph tells us, unless it’s that people are more likely to buy private label food for dogs than they are for cats. We can also see from this graph that we’re spoiling the little guys. You know that I’m a “big dog” person, but I can’t argue with a trend. It doesn’t look, though, as if very many people are jumping on the frozen and freeze-dried trend, which doesn’t surprise me – I’ve priced those foods, and I don’t feel inclined to take out a second mortgage to feed my dogs! As I’ve just stated, people are buying pet food online, and from what we’re seeing on this graph, there’s little doubt that Chewy.com owns the market! The online giant Amazon.com comes in second, but it’s not really what I’d call a close second. Well, it would seem that I’m not alone here! As I’ve said, I feed generic dog food, and from what this graph is telling us, so do a lot of other people. “Private label” pet food is nothing more nor less than pet food that’s made by a certain manufacturer and sold under a “store” name. Depending on the store, a bit of vigorous Googling might tell you who is actually making the dog food that you’re buying, or it might not. Personally, I don’t think it much matters who is making your dog food – what matters is what’s in it. Read the ingredient list and buy accordingly. Okay, again I have to point out that I am not about cats. However, I find it interesting that this graph would seem to indicate that cat people are more likely than dog people to care about feeding brand name food. I don’t understand cat people…. Now, let’s move on to what’s moving and shaking pet people these days. I remember, back when I was growing up, that most people simply fed their pets whatever was left over from their own meal. Until I grew up and moved away from home, I didn’t even know that there was such a thing as food made especially for pets! Back then, we probably fed a lot of things to our pets that we really shouldn’t have (for more on this see my post, Your Dog is Not a Human, So Don’t Feed Him Like One). We know better now. But wow, have we ever taken it to extremes! Now, we care very much about what is in our pet food. We insist on natural, “clean” ingredients, and much of the time, as I’ve previously suggested, we feed our pets better than we feed ourselves. I’m not suggesting that this is a bad thing. In fact, I am very much onside with anything that helps our pets to live long, healthy lives. But just look at these graphs! This graph shows overwhelmingly that we don’t want GMO ingredients in our pet food. And this graph shows that the trend is on the up-swing. As we can tell from this graph, another thing that we don’t want in our pet food is grain. I wonder, though, having fed a number of long-lived dogs on food that most definitely contained grain, whether this is actually a more desirable diet, or a response to hype on the part of pet food companies. But then, what do I know? From this graph, it would seem that most people prefer to eschew grain in their pet food. Here, we see a steady increase in the preference for natural pet food on the part of most purchasers. Organic pet food also seems to be increasing in popularity. Now, let’s consider how we buy when it comes to our pets. You can tell from the information that I’ve already offered that we’re spending money on pet food and supplies – a lot of money! But where are we spending it, and what are we looking for? From this graph, you can see that we’ve continued to spend money on pet food over the years. There have been a few ups and dips, but generally speaking, we’re spending consistently. Clearly, we’re buying online, but is online purchasing replacing brick and mortar stores? More on this in another graph to follow. Do you have any idea how much it costs to maintain your pet’s oral health? Think about this – a root canal for your dog can cost anywhere between $1,500 and $3,000 for a routine procedure, and up to $6,000 if there are complications. Given those figures, it’s little wonder that when people are looking for pet food, one of the main considerations, as shown in this graph, is how good the food is in terms of dental hygiene. Skin, coat, joints, heart health and other considerations don’t even register in comparison. We are still overwhelmingly buying in brick and mortar stores – 90% of us, in fact. Only 15% of us are buying online, and the smartphone people haven’t caught up at all, accounting for only 5% of purchasers. Most people seem to agree that they would pay more for healthy pet food, with 36% of people agreeing strongly, 39% agreeing somewhat, and only 2% disagreeing. More cat owners than dog owners buy at brick and mortar stores, but not by much. 81% of cat owners want to buy at a physical location, compared with 76% of dog owners. Convenience is the primary motivator when it comes to buying pet food online, followed by competitive pricing, value and product selection. A significant amount of purchasers simply report that online buying is their “go to” method. It looks like there are a lot of different factors that come into play when we’re considering where, and how, we buy pet food. Many of us still like to go to brick and mortar stores, while others like the convenience of buying online. Wherever we buy, though, it seems that we’re very concerned about what’s in our pet food. We’re also concerned about what could happen down the road in terms of our pet’s oral care. From what I’ve been able to determine, I don’t think that our buying patterns when it comes to our pets differ much from what we’re concerned about when it comes to our own needs – we consider cost, benefit, and outcome, and buy accordingly. I’ve enjoyed taking a look at the pet food trends and analysis statistics, and hope that you have enjoyed it as well. If I’ve learned one thing in the course of researching this post, it’s that people are beyond willing to pay a lot of money for pet food and supplies, and that pet stores are big business! I can’t think of anything to complain about in that – I love my dogs to distraction, and I don’t begrudge the money I spend on them. It makes me happy to know that other people feel the same way. Americans spend money on their pets, and that’s not a bad thing. If you spend money on your pet, there are worse ways you could impoverish yourself. So buy those toys, clothes and treats. And although I don’t personally buy expensive food, if you want to do that, go for it. It’s just money, and what you spend on your pets you’ll get back a million times in unconditional love. I wish you and your pets many, many years of happiness together.